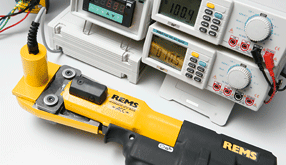 REMS GmbH & Co KG - REMS – for professionals. REMS produces machines and tools for professionals – the demands required are high. REMS fulfils its tasks with competence, responsibility and a first-rate service. This also includes the swift delivery as well as maintenance and repair work. A high degree of flexibility and absolute reliability are the basis for the excellent service. The whole logistics organisation is oriented towards the needs of our customers. In order to be able deliver promptly REMS keeps more than 10,000 items ready in the central storage facility. All wear and replacement parts are always available. A service that keeps down-times to a minimum. In the case of a repair the area-wide network of contracted customer service workshops is available for a rapid and professional repair. 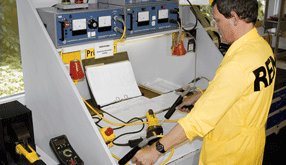 Highly-qualified and well-trained staff repair and maintain the machines and tools for our customers. After completion of the repair or Inspection the products are returned again to the customer by the fastest means. Speed is a question of logistics. 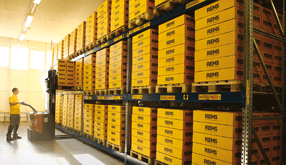 REMS keeps wear and replacement parts in stock in a 14,000 m² storage facility. The demands at the building site are extreme – wear parts are worn, the need for repairs arises. The REMS customer services department is ready and flexible. There is an extensive service organisation in more than 25 countries. Service is extremely important for REMS: All demonstration vehicles for the more than 200 REMS specialist advisors are fitted with testing equipment with which the function test and force of pressure measurement for REMS radial presses can be carried out on location everywhere.